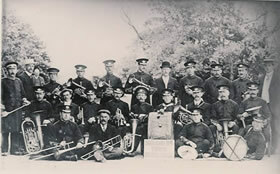 The Band began life in 1908 as the Skegness Boy’s Brigade Band, under the direction of J. Hudson but had to disband on the outbreak of hostilities in 1914, since most of the men were territorials. It was reformed in 1928 as the Skegness Town Band, with Wilfred Keyworth as Conductor. The name was changed to Skegness Silver Band to reflect the band’s increasing stature and competence. We are unsure just when this name-change took place. Members are now looking forward to celebrating the centenary of the Band’s first foundation.